I've had a Sony PCM D-50 handheld recorder for many years now and I did countless recordings with it. It's inexpensive and yet feels professional. It's build sturdy and has some cool features, even digital input. I pack it when I'm going on vacation and I bring it along when I'm on the mixing stage because it's the fastest way to record some extra stuff and put it in the mix. However, it's still just a handheld with, well, kind of crappy mics. And there's no phantom power and no symmetrical ins. There's a terribly overpriced and way too large expansion unit with phantom-powered XLR-ins offered by Sony, but I don't even want that because I don't trust the build-in preamps so much. 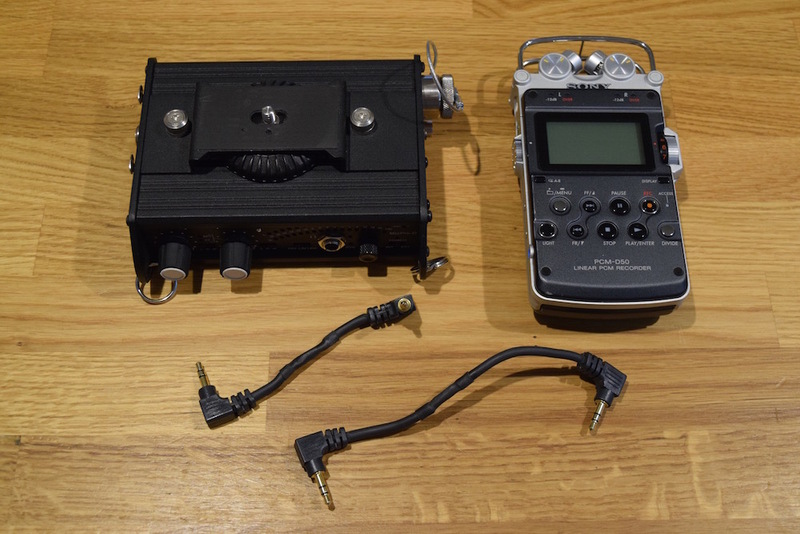 Recently, I picked up a used Sound Devices MixPre-D, which supposedly uses the same circuit designs as their top-of-the-line products. And it came with a DSLR camera mount, so I could just attach my Sony thru its backside 1/8" socket on top of it, using it as the recorder. Unfortunately, the Sony has optical digital inputs only, so I couldn't connect the two digitally to use the MixPre's A/D converter. But I figured that the Sony's line input stage and A/D converter wouldn't be too bad and would still give me decent quality. So I soldered two mini jack cables: one from the MixPre's line out to the Sony's line in, and one from the Sony's line out to the MixPre's tape return. It's not a 702 but it works pretty well for me. The build-in tone generator of the MixPre makes calibration easy. All I had to do was setting the Sony's record level to align both machine's meter readings, which resulted in a value close to a 6 (out of 10) on the Sony's gain knob. The big question is: how does it perform in terms of sound quality? Again, quite easy to test, since the MixPre is also a USB audio interface. You can connect it to a computer running some recording software and record with it. Simultaneously, the Sony can record the MixPre's line out. I did that with recording guitar, some sounds and my own voice using my Schoeps MK4 / Sennheiser MKH30 M/S-Rig. One recording was done with Pro Tools using the MixPre's A/D converter and at the same time, the Sony recorded the MixPre's line out using its own A/D stage. Then I imported that file into Pro Tools and put it in sync with the MixPre's recording. With those two signals playing next to each other, I could easily switch back and forth to compare. Originally, I planned on posting an A/B comparison here, but I wasn't able to spot a significant difference in terms sound quality, so I skipped that. Next, I tested self noise. Again, I made simultaneous recordings but without a mic connected. I slowly turned up the preamp gain of the MixPre from min to max while keeping the Sony's input gain at its calibrated position (a little under 6). As you can see in the diagram above, there's a certain point (at 6 or "one o'clock" gain) where the noise of the MixPre's preamps gets louder than the noise of the Sony's line input stage. In other words the Sony only has a negative effect when operating below that gain level. Generally, this is good because when recording loud sounds, noise is usually less of a problem than recording near silence. 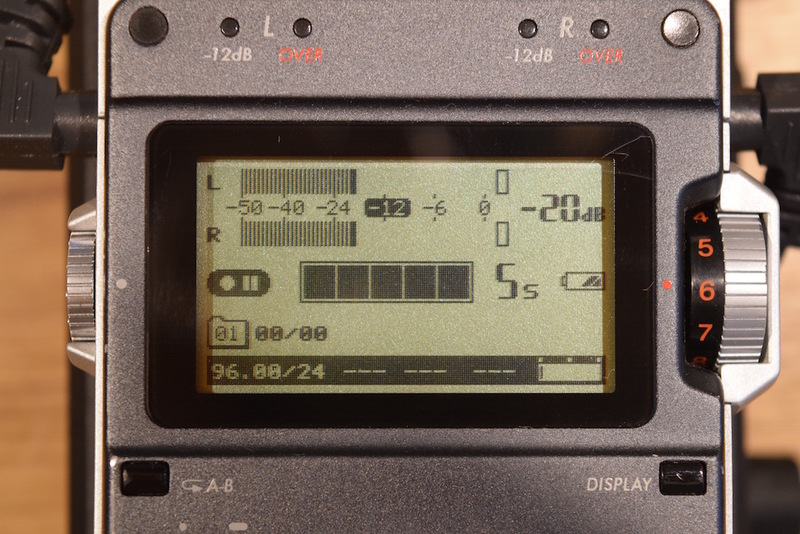 Still, the bottom line here is that you loose up to 5 dB of dynamic range when using the Sony recorder. In conclusion, I'd say that using pro-grade mics and preamps on cheap handheld recorders is a smart choice when price is an issue. I guess that most of us start off with an inexpensive recorder but later feel the need to improve quality and record with less noise. Products like the MixPre-D make a huge difference, even if their A/D stage isn't used in the setup. 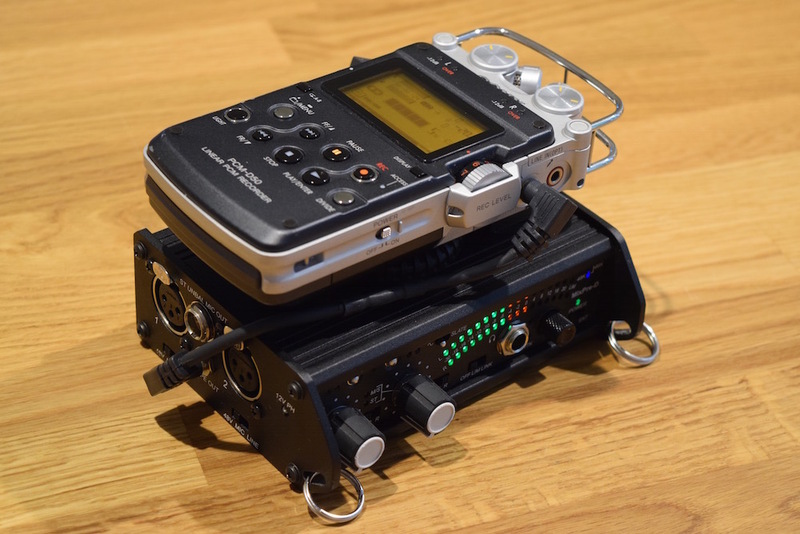 You end up with audio quality almost as good as the Sound Devices 7xx series. But I'm still happy with it. Please feel free to use the comment section if you have any questions or thoughts regarding this or if you have similar setups. I'd be happy to hear about it!